San Francisco firefighters wear the traditional Cairns and Bro. 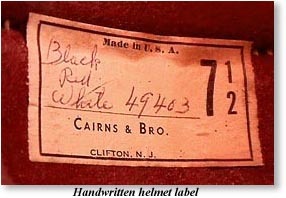 New Yorker helmet modified to meet Federal safety requirements. 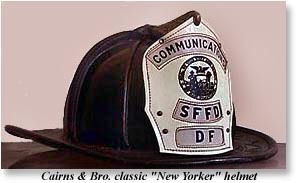 For a time in the 1980s the San Francisco Fire Department switched to a dark plastic Darth Vader helmet, unfavorably reminiscent of those worn by the German Army during WWII. They were not popular with the firefighters, and some of the helmets actually melted in fires. In the late 1980s the Department switched back to the traditional leather helmet. This 1930 New Yorker magazine article gives the history of the Cairns and Bro. leather helmets. In our simple, childish way, we always believed that the eagle adorning a firemans helmet meant something specialthe spirit of American enterprise, maybe, or onward to victory. We were wrong. The eagle, it seems, just happened, and has no particular significance at all. Long, long, ago, around 1825 to be exact, an unknown sculptor did a commemorative figure for the grave of a volunteer fireman. You can see it in Trinity Churchyard today; it shows the hero issuing from the flames, his trumpet in one hand, a sleeping babe in the other, and, on his hat, an eagle. Now, nobody was wearing eagles at the time; it was a flight of pure fancy on the sculptors part, but as soon as the firemen saw it they thought it was a splendid idea, and since every fire company in those days designed its own uniforms, it was widely adopted at once. It has remained on firemens hats ever since, in spite of the fact that it has proved, frequently and conclusively, to be a dangerous and expensive ornament indeed. It sticks up in the air. It catches its beak in window sashes, on telephone wires. It is always getting dented, bent and knocked off. Every so often, some realist points out how much safer and cheaper it would be to do away with the eagle, but the firemen always refuse. We learned all this about firemens hats in the course of a little talk we had the other day with Mr. John Arthur Olson, of 183 Grand Street. Mr. Olsons father started making hats for firemen in 1867, and Mr. Olson himself has been at it all his life. Recently, he amalgamated with his only rivals, Cairns & Brothers, a few doors down the street; they comprise now the only firm in America in the business. 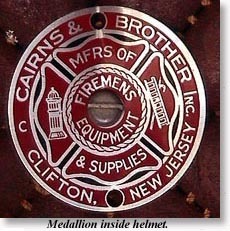 Foreign firemen wear a metal helmet which weighs five pounds, but our fire laddies hats weigh only thirty ounces. Despite this they give even better protection against falling bricks than the European ones do. They are made of stout tanned Western cowhide, a quarter of an inch thick, hand-sewed, reinforced with leather strips which rise like Gothic arches inside the crown, padded with felt. The long duckbill, or beavertail, effect which sticks out at the rear is to keep water from running down firemens necks. Hats for battalion chiefs and higher officers, are white, everyone elses black. Hook-and-ladder companies have red leather shields (attached just under the eagle), engine companies black with white numerals, the rescue squad blue. According to Mr. Olson, there isnt much money in making firemens hats. They sell for eight dollars and seventy-five cents, and as it is all handwork the profit is small. Besides, they last so longabout ten years, on the average. Matter of fact, the only thing that keeps the shop busy is the business of repairing the eagles, which are always coming in for regilding, refurbishing. For fixing eagles, the standard rate is one dollar, and has been for generations.